I live within the influence/taxation zone for the proposed Sacramento Streetcar, Sacramento Measure B, so I received a voter information pamphlet, and presumably will receive a ballot within a few days. Let me say right up front that I am voting yes. I support the streetcar for its economic and transportation benefits. However, I’d like to address some of the anti arguments. The pro side is well represented at http://gosacstreetcar.com, and the other websites linked from there. I have not found a website for the anti side, but their arguments are in the information packet and on the sign above. The streetcar district tax will pay only for construction. It will cost district property owners $90 million over 30 years, and will be passed on in commercial and residential rent hikes to tenants. Yes, that is the way infrastructure projects work. No project in Sacramento, nor probably in California, has had operations costs built it. Maybe they should, but demanding that this be the first project to do so makes no sense. The streetcar project will operate at an enormous annual loss. Ticket sales are expected to cover about 20% of cost of operation; the other 80% will require a subsidy. The shortfall will likely come from the City’s General Fund, reducing local services such as parks, bike lanes, street repairs, the homeless, and police. All transportation infrastructure operates with subsidy, including the streetcar. Roadways only recover 50% or less in gas taxes, but if the congestion, air pollution, services, housing affordability and livability costs of roadways were added in, the recovery would be about 5%. Transit is usually about 50% subsidy, and the streetcar may be a bit more than that. This is not a valid argument against the streetcar. If we are talking about economically productive investments, the streetcar blows roadways out of the water. The streetcar project is wasteful transit duplication. It runs on, or near, the same Streets served by existing light rail and buses. It will worsen mobility for pedestrians and those using the existing public transit system. Tracks add danger to bicyclists. Yes, tracks can be dangerous for bicyclists, but the solution is to provide bicycle-priority streets parallel to the tracked streets, and to install rubber flanges at conflict points that prevent bicycles from being captured by the tracks. I don’t understand how anyone could argue that we have too much transit. We in fact don’t have enough. Transit across the river is infrequent. Even in downtown, many areas are transit poor. When Sacramento had a much smaller population (regionally), we had a high density of streetcars. I don’t get the statement that it will worsen mobility for pedestrians. In what way? The project worsens traffic by adding slow-moving, frequent-stopping streetcars. These will create delays at intersections and to-and-from I-5, especially on the 3rd Street route that crosses L, J, and I Streets. The entire argument about worsening traffic is bogus. It is the excess of cars on our streets that create congestion, not transit. I expect that many people who used to use I-5 go get to work or to evening events will either use light rail all the way in, or will park and use the streetcar to get to their destination. That is part of the purpose, and I think it will be effective. Politicians hype the streetcar as a catalyst for development. However, development is already happening on K, R and 16th Streets and other parts of the Central City. Why squander scarce City resources on an unnecessary project? Yes, there is risk in using the streetcar to generate economic development. It has worked many places, but has not worked in a few. But there is a circular logic being pushed by the anti group. “…development is already happening….” AND “The Streetcar won’t create jobs or spur economic development. 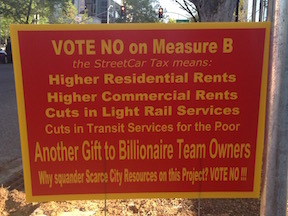 No modern streetcar has ‘revitalized’ any area unless accompanied by substantial subsidies to developers – which Sacramento cannot afford.” Well, many subsidies are already in place, but the anti folks are saying we should not take advantage of that by building a streetcar. Can’t have it both ways! Overall, the anti folks are pushing remarkably suburban arguments for an urban area. Downtown/midtown works exactly because it is not like the suburbs. Yes, there is a great deal of room for improvement, but the transit density downtown/midtown is part of what makes it a great place to live. I want more transit, not less. I want the streetcar! We do provide immense subsidies to corporations. I am not against all subsidies, but Sacramento (as with nearly everywhere else) has not been smart about subsidies, spending large sums to help big business, including sports team owners, and spending very little to help economic vitality for small business owners and to provide amenities for residents. There is clear evidence that investments in small businesses are far more productive of both property tax and sales tax revenue than investment in big corporations. The city does need to look at wasteful spending and find better ways to invest what it has available. I don’t see much evidence that Sacramento, SacRT, or the other partners have done deep thinking about how this project relates to the existing transit network and to plans for expansion, both in capital expenditures and in operations/maintenance. SacRT is grossly under-resourced. Is this the best investment of limited funds? I believe it is, but I don’t have the evidence for that, and I’m concerned that the question hasn’t really been asked or answered. I don’t think there is any evidence at all to support the anti argument that light rail service will be reduced. However, it is true that bus service might not be increased because funds are going to the streetcar. SacRT continually goes through a process of identifying the most “efficient” routes in terms of ridership, fare recovery, and populations served. The transit network was decimated during the downturn and there are still huge gaps in the bus system. Does the streetcar compare favorably with filling those gaps? I’m not sure. For better or worse, people are more likely to vote for a streetcar than an increase in bus service. There are equity issues to be addressed. As a gross (over)-generalization, the order of transit preferred by high income people is: commuter buses, streetcar, light rail, and bus, with variations depending on the quality of each type. Does spending money on a streetcar instead of a bus result in inequity? Perhaps. We need to talk about this. So, if you live in the central city and get to vote, please vote yes. And, please get involved in transportation issues to hold the City of Sacramento and SacRT accountable for analyzing the benefits and costs of any transit change, expansion, or contraction. 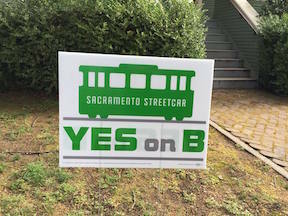 And if a transit (only) measure to support SacRT comes to the ballot, please “climb onboard”and vote for it. 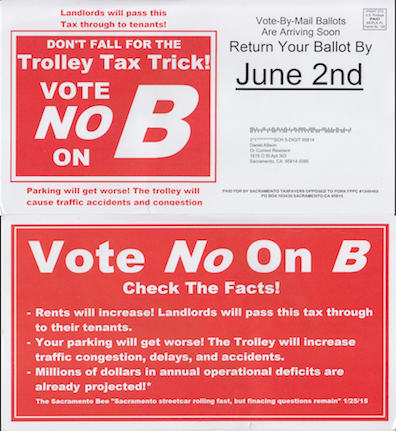 I received a mailer today from the No on B group. It turns out the group is Sacramento Taxpayers Opposed to Pork (STOP), which has a Facebook page and website. This is the group that has brought several lawsuits against the arena. It may be that they are anti-streetcar because they associate the streetcar with the arena. The About tab on the website has information about the four board members, but there isn’t any information on where their funding comes from. Though I’m not fond of some of the people in favor of the streetcar, they have been pretty transparent about who is involved and their funding.